TONY Clubb has signed a long-term deal with Wigan. The prop was 18-months into the four-year contract which saw him move from London to the Warriors. But he has been rewarded for his strong form with a fresh four-year contract. Warriors have already taken out an option on Dan Sarginson’s deal for next season, and coach Shaun Wane has revealed he wants to extend fellow centre Anthony Gelling’s stay at the club. Clubb is currently sidelined with an injury, but Wane expects him to press his England claims when he returns. 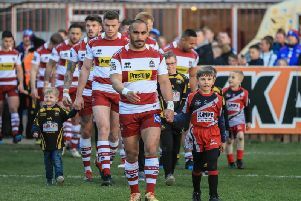 Wane said: “Tony is one of the best front-rowers in the competition and has been in fine form.